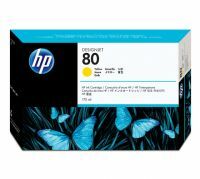 The HP 80 Ink Cartridges are designed to work with HP 80 Printheads as part of a modular ink system. 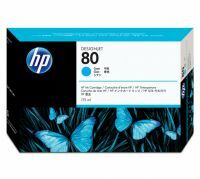 HP 80 Ink Cartridges are formulated to provide professional results that are always clear, always sharp. Available in 350-ml cartridges for high-volume, overnight, or unattended printing, or in 175-ml, which is ideal for less frequent color printing jobs. They are the perfect choice for users who produce precise black-and-color line drawings or high-quality color renderings, maps, and graphics. C4874A The HP 80 Ink Cartridges are designed to work with HP 80 Printheads as part of a modular ink system. HP 80 Ink Cartridges are formulated to provide professional results that are always clear, always sharp. Available in 350-ml cartridges for high-volume, overnight, or unattended printing, or in 175-ml, which is ideal for less frequent color printing jobs. They are the perfect choice for users who produce precise black-and-color line drawings or high-quality color renderings, maps, and graphics. HP Jetexpress technology delivers a 2.54 cm wide print head with 512 nozzles for fastest, most precise printing of any HP Designjet printer. Smart features monitor ink levels to minimize possibility of running out unexpectedly. With their built-in smart features, HP 80 printheads and ink cartridges automatically work with the printer to ensure outstanding results every time. Printhead cleaner extends printhead life and ensures consistent performance. 175 ml dye-based colour ink cartridges for high-volume, overnight or unattended printing. Modular ink supplies system for easy selection – only replace components when they actually run out. To Recieve updates and possible rewards for Hewlett Packard (HP) HP 80 175-ml Magenta Ink Cartridge please sign in. To Recieve updates and possible rewards for Printer Cartridge, Ink & Toner please sign in.